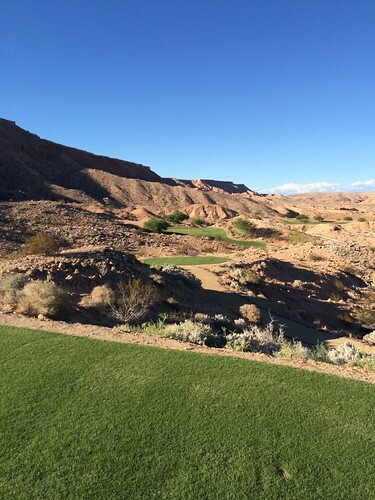 I was attending a conference in Vegas, and decided to arrive a few days early for some golf. I called a friend, who was into it, and we booked a package and played four courses in 3 days; 18 on Saturday, 36 on Sunday and 18 on Monday. And it was awesome! Such beautiful views, and friendly people, as you’ll see. 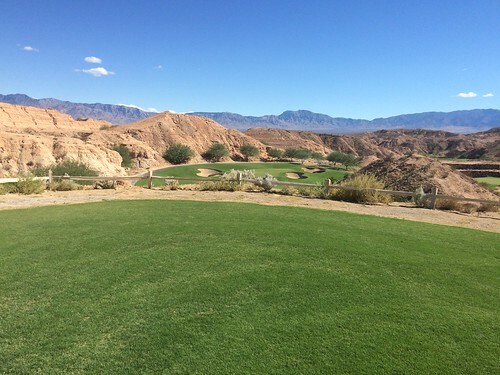 Our first round was at Conestoga Golf Club, in Mesquite, Nevada. We got off the plane, hopped in the rental car, and hit a little traffic; ouch. We were going to be a little late, and called the course which was very accommodating; great group in the pro shop. We were able to bump our tee time back a half hour. Conestoga had plenty of length, with the Blacks playing over 7,200. We played the Golds, which were 6,751 yards. 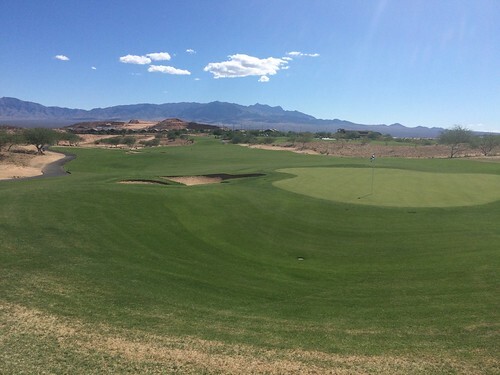 The first hole is a straightaway par 4, playing 388 yards. Here’s a shot from the back of the green looking towards the tee. Forgot how beautiful it is out here; what a beautiful start! 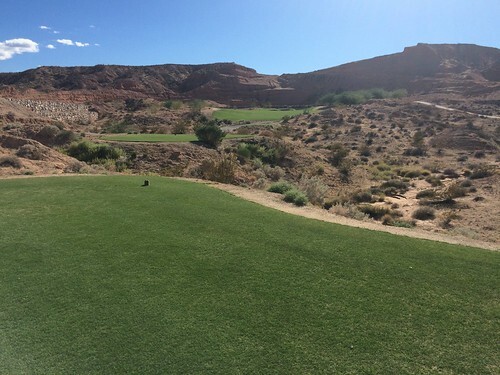 The second hole is only 162 yard par 3, but it is severely downhill. 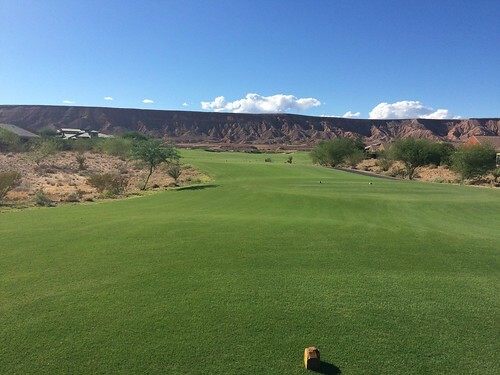 Only on the second hole and already significant elevation change (which is a running theme in Mesquite.) I hit it a little long and ended in the bunker behind the green. Almost got up and down, but happy with a bogey. The 5th hole is the next par 3, this one playing 188 yards from the Golds. As you can see, there are bunkers surrounding this green. Luckily I play a fade (most of the time), and aimed towards the left bunker and faded it right in, two-putting for a par. The seventh is a 285 yard par 4, and plays as the second easiest hole on the course. 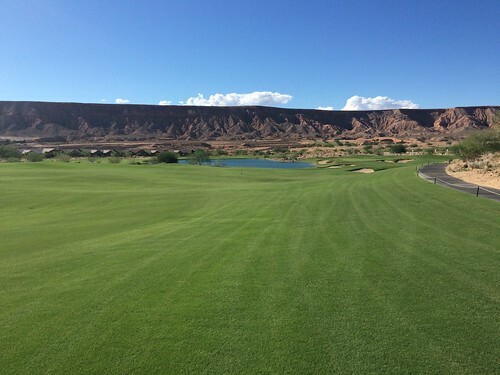 I recommend hitting an iron off the tee, and giving yourself a 100 yards or so into the green, as there’s trouble around the green that’s tough to see from the tee. 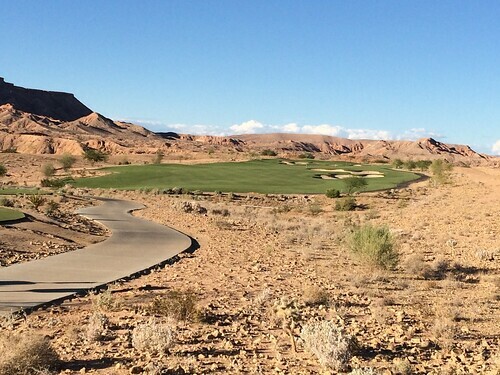 It might be worth driving up and taking a look before your tee shot if you have time. 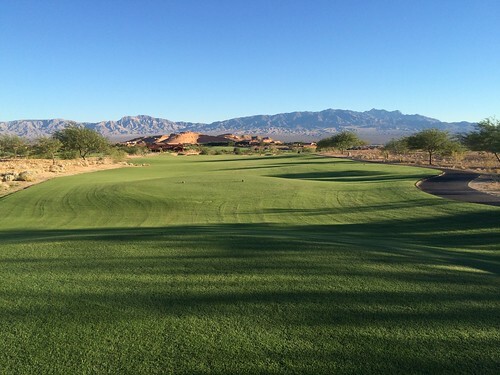 The ninth is a long par 5, and rated as the hardest hole on the course. It plays 564 yards from the Golds, and a whopping 595 from the Blacks. 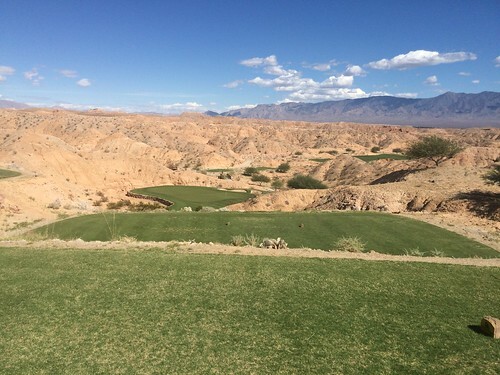 Here’s a look at the tee shot; beautiful place. Even with a good tee shot I was left with much more than 300 yards so I laid up. Here’s a view of the green. There is water left, and lots of bunkers so be careful. I ended up in the bunker on the right and bogeyed. 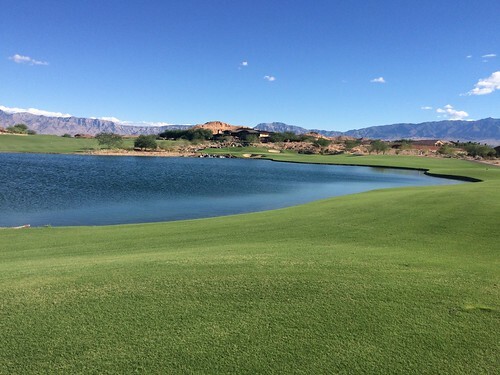 The tenth is another long par 3, at 186 yards from the Golds, with all carry over water. There is room to bail to the right but I went for it, and ended up a little long (which was fine.) Good chip left me with a 3-footer for par. The 11th is a long, tough par 4 (460 yards), but if you get a bigger score then expected, you can make up for it on the 12th, which is the easiest hole here; a par 5 playing only 513. 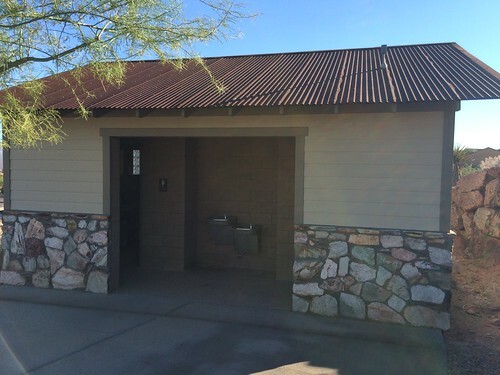 After the twelfth is an on-course restroom, which was clean and appreciated. The 14th is a short par 3, playing only 136 from the Golds, but the wind was definitely in play, changing the hole dramatically. 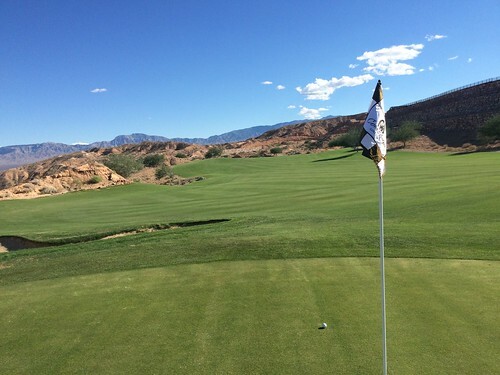 My advice is to play the wind, and aim for the right tier on the green. I ended a little short but had a good chip and had a gimmie for par. The 16th is another long par 5, playing 550 from the Golds. The tee shot only needs to be left of the bunkers; lots of room so let it fly. After the tee shot, I laid up to a decent distance, especially once I saw the green. Again, surrounded by bunkers. For me, it was the right choice. The 18th is a long, strong finishing hole, playing 444 yards. My tee shot was great, but I hooked the approach, ending well left of the green. Had a great pitch but missed the putt for a finishing bogey. As part of our package, our lunch was included with this round of golf. As I said, we were running late, so they let us use our lunch tickets after the round, which was great. 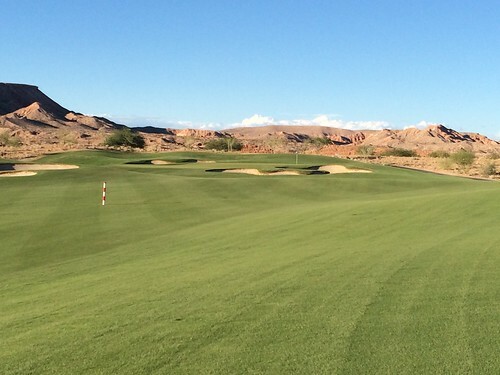 Beautiful clubhouse, and a hearty meal and a few beers to finish the first day in Mesquite. Thanks GolfMesquiteNevada.com for setting up the package!